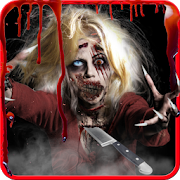 Scary app is a fantastic, free application to frighten. Using scary app you can make your friends a joke. Inside app you will find two scaring options. The first mode is frightening in night vision. Specter appears when you will use night vision simulator. In this mode, you can take a picture with zombie and bogeyman! The second option is scaring outside the scary application. While using your phone by your friend, suddenly appears on the screen frightening animation with bogeyman . When you selected all settings, press the START SCARE and give your friend the phone. After a set time, appears on the screen scary animation with sound, that will surprise your friends. In case of any problems with the effect of scary app, instead of giving us the negative opinion, please send us an e-mail and review briefly the problem. It will help us to solve it in the next updates of app. Scary app is free but contains ads inside app. Revenue from advertising will help us to create new attractive wallpapers and applications. All permissions are required only for advertising and are supported by trusted vendors.